I was on vacation last week, and as per my usual, it was more of a “don’t go to work for a week” kind of vacation, as opposed to other people who generally do things when they take time off. I mean, I did things, but from the comfort of my own home. A lot of those things, surprisingly, were movies. I credit the How Did This Get Made? podcast almost completely for that, as it has encouraged me to watch a lot of movies lately. Like, I’ve gone from one or two a month to several each week. These are not necessarily “forgotten films” in the usual context of movies I own but haven’t watched, but they’re all movies that I’ve wanted to see at some point. And it’s just nice to have another collection of films to throw under that umbrella. Two entries does not a proper series make. A film about birds who attack people, much like Alfred Hitchcock’s The Birds. Only, Birdemic was made on a shoestring budget by an actual crazy person. 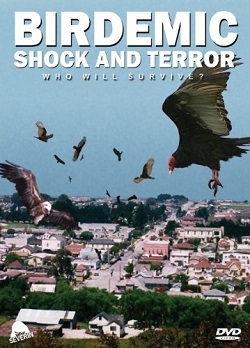 The acting is mostly terrible, the plot makes zero sense, and the birds don’t even show up until a good 45 minutes in. Oh, and also the birds are 2D clip art and explode like kamikaze fighter planes. While the film is sold on the killer bird action, it’s actually billed as a “romantic thriller,” which is a gross overstatement on both counts. I mean, technically, there’s romance, but the main character is such a poor actor that he seems more like a robot or an alien than a man. And the thrills? Yeah, there aren’t any, really. The stakes are so low, and the characters so stupid, that you simply can’t be bothered to care. You don’t watch Birdemic for its artistic merits. You watch Bridemic because it’s one of the most staggering train wrecks ever committed to film. It’s really a must-watch for anyone who likes bad movies. If nothing else, listen to the Birdemic episode of How Did This Get Made?, which is fantastic. It features Weird Al as a special guest, and they also managed to bring in Whitney Moore, who plays the female lead in Birdemic. It’s really, really worth your time to give it a listen. Another awful movie that I watched because I was so intrigued by it after listening to the episode of How Did This Get Made? dedicated to it. A bad E.T. wannabe where the aliens are so ugly, I found it difficult to eat while watching it. Like, I was sitting there with a delicious pizza, but every time an alien showed up on screen, my stomach turned a little. They’re skin looks so splotchy and sickly, and their faces are like nightmares come to life. Poorly-animated life, but life no less. Anyhow, the movie is about a family of gross aliens who end up on Earth (via space probe vacuum), and the little kid alien gets separated from the rest. “Mac” finds his way into a family’s new home, and obviously the younger human child (who I forgot his name and also is bound to a wheelchair) finds him and decides to help get Mac back to his family. This journey is, of course, punctuated with wacky hijinks, like the wheelchair kid rolling into a ravine, and a good five minutes of trying to wrangle Mac with a vacuum cleaner. It does raise the stakes a little by blowing up a grocery store and straight up killing wheelchair kid (briefly), but mostly it’s just worth watching for the insane McDonald’s birthday party dance scene. This is a dance scene the likes of which you’ve never seen before, and never seen again. It’s bonkers. If anything, you should probably just look that up on YouTube. 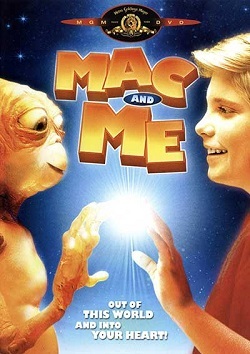 Mac And Me on the whole is not really worth your time. I love claiming to be a connoisseur of old creature features from before my time, but the nasty truth is that I have a limited knowledge of that era of film. So I took a single step towards fixing that by watching the 1958 version of The Blob. Unlike the other movies on this list, which had all piqued my interest fairly recently, this one has actually been on my to-see list for years. The plot of this one follows the story of a young Steve McQueen and his girlfriend after they see a comet fall to Earth that contains a horrible alien monster. That horrible alien monster just happens to be a sentient blob that absorbs people and grows bigger and bigger over time. I’m sure you know the story. I’ve seen it parodied countless times. I’m sure it has to have some sort of clout in its genre. 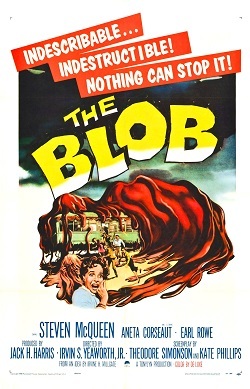 Since this is an older monster movie, with a monster that isn’t a simple rubber mask, you don’t really get to see all that much of the Blob itself until the last act. It makes appearances, sure, but mostly it just sits there and jiggles nefariously as any nearby characters freak out and proceed to be killed off-screen. While most of the movie consist of Steve McQueen shouting about the Blob and everyone else thinking he’s nuts, the finale is actually pretty tense and for a while I was seriously wondering if this was the kind of movie that had the cojones to let its main characters be killed. Alas, t’was not the case. I thought it was a very enjoyable flick, but then I like most sci-fi movies of that vintage. I’ve got the 1988 remake on deck to be disappointed by sometime in the near future, and there’s supposed to be another remake out this year, but I’m not entirely convinced that it’s a real thing. Now here’s a type of film I haven’t watched in a long time: a zombie movie. Which is totally bonkers because, as I’m sure you know, zombie movies used to be my thing. Like, it’s the thing that people knew me for. A few people, anyway. Maybe not everyone. Also I don’t remember the exact timeframe. It may have been a dream. 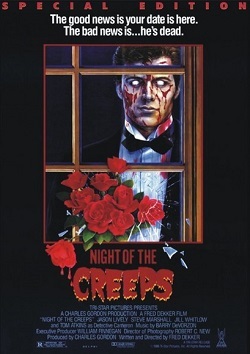 Night of the Creeps, though! It begins… in space? Yes, the film begins with a pudgy alien running through a spaceship from two other aliens. He jettisons some sort of capsule into space, and then we cut to the most beautiful homage to classic horror films. Two kids chilling at makeout point see something crash down from the sky, and of course go check it out. It’s basically a shot-for-shot remake of the opening of The Blob, only with a token escaped maniac on the loose for good measure. Fast-forward thirty years, where two college dorks accidentally unleash space leeches that somehow reproduce in human brains, thereby zombifying them until their faces explode in a shower of baby space leeches. Of course all Hell breaks loose, and it’s up to Dork #1 and Gruff Police Detective to save the day. Being an 80’s horror comedy, there are basically no surprises here, and everything goes down exactly as you’d expect. I suppose the high point is when The Love Interest gets a flamethrower and starts toasting zombies/space leeches instead of just wailing helplessly. Night of the Creeps isn’t especially creepy, or even all that funny. The effects aren’t the best, and the characters are almost all uninspired archetypes (Gruff Police Detective is awesome and literally insane). That said, I didn’t think it was a bad film. It doesn’t ever drag, and I did laugh at least a couple of times. Mostly I just love the black-and-white opening scene. I’d recommend you give it a watch, as it’s definitely still worth talking about. I just have one lingering question: what was the deal with the alien at the beginning? Why was he trying to save the leech capsule? Was he infected? He must have been infected, right? Ah, I suppose it doesn’t really matter.